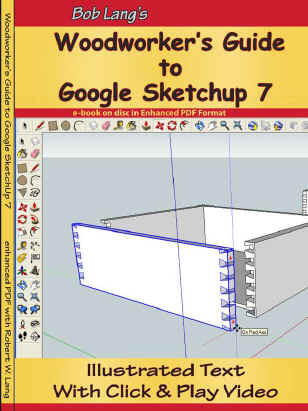 This is a comprehensive reference, designed to teach woodworkers how to use the popular, free 3D design tool, Google SketchUp. From the basics of setting up the program to the fine points of making detailed models of your next project, Woodworkers Guide to SketchUp provides the answers in an easy to use, easy to search digital publication. 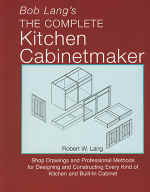 Robert W. Lang has years of experience as a professional woodworker and designer and shares the secrets of designing furniture and cabinets efficiently on your computer. This Woodworking eBook is a new approach to learning. Place the disc in your computer’s drive and launch Adobe Reader. It looks like a book, with clear step-by step instructions and hundreds of illustrations, and you can print a hard copy for off screen reading and reference. 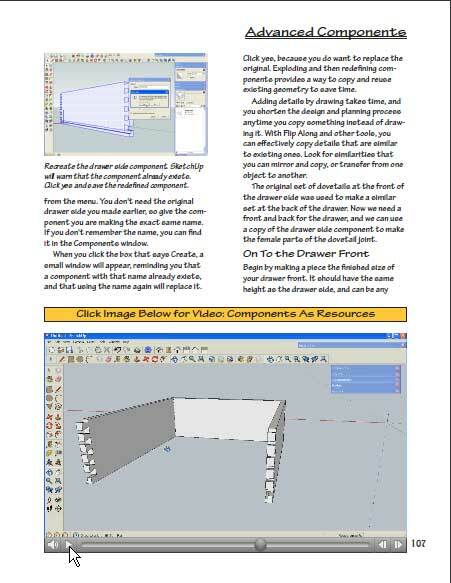 Read on your monitor and follow along in SketchUp. Video tutorials are embedded within the pages. Just click on the image and a short video plays to show you exactly what to do. Built in bookmarks and search functions find the information you want instantly. This digital publication comes to you on a single disc in Adobe PDF format. Requires Adobe Reader, and can be read on both Macs and PCs. click on the yellow "sticky note" after downloading for instructions on playing embedded video. *Note to International Customers: recent postage rate increases have forced us to pass on our costs for shipping outside the United States. The current price of a stamp for a first class package is $6.55. Please e-mail to arrange payment. or send me an E-Mail to find out where and when, or to schedule a class in your neighborhood.